Galileo first turned his telescope to the heavens in 1609, marking the dawn of modern astronomy. To commemorate 400 years of exploring the universe, 2009 has been designated the International Year of Astronomy. In conjunction with Galileo's birthday on Feb. 15, NASA is releasing images from its Great Observatories — the Hubble Space Telescope, Spitzer Space Telescope, and Chandra X-ray Observatory — to more than 100 planetariums, museums, nature centres, and schools across the US. The selected sites will unveil a large, 9-square-foot print of the spiral galaxy Messier 101 that combines the optical view of Hubble, the infrared view of Spitzer, and the X-ray view of Chandra into one multiwavelength picture. "It's like using your eyes, night vision goggles, and X-ray vision all at the same time," said Dr. Hashima Hasan, lead scientist for the International Year of Astronomy at NASA Headquarters in Washington. Participating institutions also will display a matched trio of Hubble, Spitzer, and Chandra images of Messier 101. Each image shows a different wavelength view of the galaxy that illustrates not only the different science each observatory conducts but also how far astronomy has come since Galileo. Messier 101 is a spiral galaxy about 22 million light-years away in the constellation Ursa Major. It is larger than our own Milky Way galaxy but similar in many ways. Hubble's visible-light view shows off the swirls of bright stars and glowing gas that give Messier 101 its nickname "the Pinwheel Galaxy." In contrast, Spitzer's infrared-light image sees into the spiral arms and reveals the glow of dust lanes where dense clouds can collapse to form new stars. Chandra's X-ray uncovers the high-energy features in the galaxy, such as remnants of exploded stars or matter zooming around black holes. The juxtaposition of observations from these three telescopes provides an in-depth view of the galaxy for both astronomers and the public. 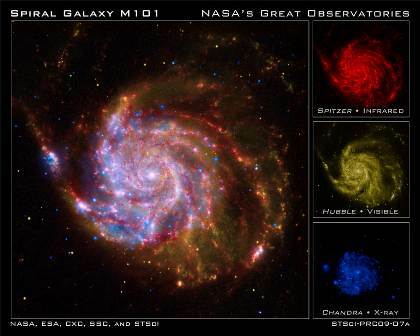 Spiral Galaxy M101 with a matched trio of Hubble, Spitzer, and Chandra images of Messier 101. Each image shows a different wavelength view. The unveilings will take place Feb. 14-28 at 76 museums and 40 schools and universities nationwide, reaching both big cities and small towns. Sites are planning celebrations involving the public, schools, and local media.